Second revised edition: October 2018. The Spanish language has fascinated me since my first contact with it, in Mexico back in 1989. I decided to study it in depth, and after 20 years living in Spain I think I speak it and I know it with some depth. When I started writing books in that language, however, I realised that a linguistic standardisation was required for the specificities of writing about music. I saw the problem as even more urgent when I began to direct other people’s research—mainly PdD and Masters’ degree theses—and on trips to visit education centres in many Ibero-American countries. For this reason, in 2007, together with bassoonist and researcher Áurea Domínquez, and my life partner, ethnomusicologist Sívia Martínez, we began work on such a project. Nine years later, Escribir sobre música (Writing About Music) was ready for publication. 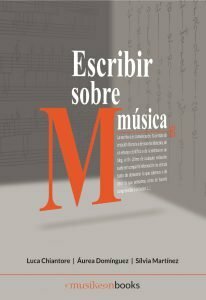 It was the first style manual ever in Spanish on writing texts about music subjects, and from here I wish to personally express my gratitude for the enthusiasm with which it was immediately adopted as a reference book in such prestigious universities as the Universidad Complutense, Madrid, the UNAM, the Universidad Veracruzana, and the Reina Sofía School of Music. From the outset, we sought to provide a coherent framework for taking on the writing of music subject texts, one that recognises the heterogenous reality of Spanish-speaking countries. The aim was not to lay down strict rules but to propose correct frameworks for shared observations, and simply to suggest criteria so that each reader can decide with liberty, responsibility, and knowledge. It is also, however, a militant text, heavily committed to offering answers to the clear trend of including foreign phrases. The book proposes alternatives, even to the often unconsciously sexist use that is habitually made of language. It also gives over plenty of space to the problems of citation, in particular in relation to how to adopt international citation norms to the Spanish language, offering in each case diverse examples with special attention to Latin American production. In the latter area, in particular, we aimed for great clarity, defending the need for precise knowledge of the differences between the bibliographic system and the author-date system, to make it possible to choose the right one in each case, and in the latter case I feel very satisfied at having recorded my strongest disapproval of the APA rules, which are absolutely inferior from all angles in comparison with the corresponding rules proposed by the University of Chicago for the same author-date system, one far better suited to musicology, more complete and respectful towards the identity of quoted offers, as well as saving the amount of characters used. The “Musikeon norms” we propose are, in fact, an adaptation to the Spanish language of those of Chicago, illustrated in this book with examples that help to clarify how to use them in music subject texts.